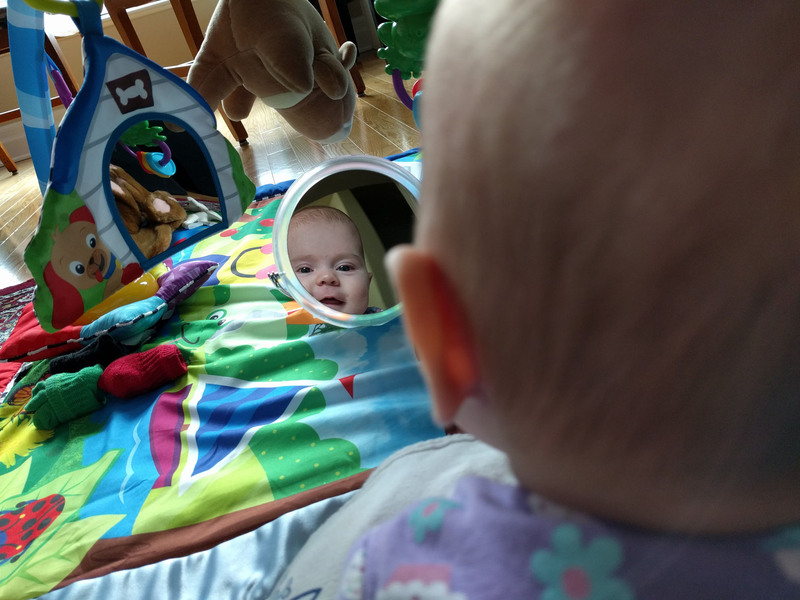 My 10-month old daughter just proved that she understands some words. Now, when we tell her to “clap your hands”, or even just talk about clapping, we get a round of applause. Pretty cute! This wasn’t one of the things we were actively trying to teach her, like “daddy”, “mommy”, “dog”, or “milk” – I haven’t seen evidence that she knows those yet. It just goes to show how learning works: motivation trumps deliberate efforts to teach. Clapping is just plain fun. It’s spooky to think about what else she might come to understand without us knowing. One of the best things about maternity leave is watching my daughter learn new things, almost daily. A few weeks ago she realized she could control her feet. This week she’s using her hands to grab at objects and starting to pull them in for further, mouth-based inspection. It really is exponential – the more she learns, the more she is able to figure out. Children also learn a lot from what they hear. And they are apparently sensitive to the particulars at a surprisingly young age. Take, for example, the phrase “some birds fly” vs. the generic version “birds fly”. Psychologists have shown that halflings as young as two years old can tell the difference between these two phrases, and they can also use the generic version appropriately. What’s more, when adults use generic language in conversation with very young children, the children are able to infer new categories and make predictions about the world. This has been shown in experiments where psychologists talk about new, fictional categories (like Zarpies and Ziblets) with children. The results of these studies suggest that children are essentialists: i.e., they tend to carve up the world into categories, and view members of the same category as sharing a deeper, inherent nature. And these categories are easily transmitted through language. This can have some unintended consequences. In her book The Gardener and the Carpenter, Alison Gopnik describes a study by Susan Gelman and colleagues where mothers and their children were given pictures of people doing stereotyped (a girl sewing) and non-stereotyped (a girl driving a truck) activities, and their conversations were recorded and quantified. It turns out that even mothers who were feminists used generic language most of the time. Moreover, there was a correlation between how often mothers used generic language and how often their children did. Saying “Girls can drive trucks” still implies that girls all belong in the same category with the same deep, underlying essence. I can’t help but wonder how this might affect our daughter as she grows up. Although her book is not meant to be prescriptive, Gopnik does say that we probably can’t avoid this by careful wording – it just wouldn’t work to try to consciously control our language. Instead, the best antidote may be to have children observe many examples and talk to many different people. I finally had a chance to watch Steven Pinker’s excellent lecture on science communication this weekend. Pinker, a psychologist, linguist and top-notch writer, argues that psychology can help us tune up our writing and become better communicators. His first point is that cognitive psychology points to the model that we should be aiming for: prose that directs the reader’s attention to something in the world that they can then come to understand on their own. He also discusses why this is so hard to do: The Curse of Knowledge. Once you know a lot about something, it’s hard to put yourself in the mindset of your readers – i.e., the people who don’t know anything about the thing you are trying to write about. This is because it’s hard work, cognitively, to keep track of what other people know. The classic example of this is the false belief task in psychology. If you show a child a box of Smarties (the chocolate candy), and then ask him or her what might be in the box, the child will say candy. Suppose you then reveal that the box actually contains something else – coal. Then close the box and ask the child what another person would think is inside. A 7 year old will correctly say candy, but a child younger than 4 or so will claim that others would think it contains coal. Up until about age 4, we don’t seem to grasp that other people can have false beliefs about the world. Pinker’s point is that this ability – also known as theory of mind – isn’t a cut and dried thing that we suddenly achieve at age 4. It’s a sophisticated skill that proves to be a challenge even for adults. His advice on writing? It’s pretty standard stuff. Pinker enlists his mom – or in other words, an intelligent reader who just happens to not know a lot about his particular topic already. His other point is to take a break from your writing before you edit, to give yourself time to shift away from the mental state you were in when you wrote it. You can also read your work aloud, since that seems to engage a different mental state as well (I wonder why?). It makes me wonder whether there is anything we can do to harness this mind reboot effect more efficiently. Say you don’t have a lot of time and your mom is not available. How can you reset your brain on demand? I’m thinking of a 20 minute nap, reading some fiction, or doing some physical exercise before editing your paper – which is best? I imagine this is something that cognitive neuroscientists will be able to tell us pretty soon. If only it was that easy for the rest of us to escape the curse of knowledge. Many linguists would claim that grammar is what sets human language apart from anything else in the animal world. Some would disagree – bird song, for example, can be quite complex and it is thought that there might be some rules involved in its underlying structure. The question is, at what level of complexity does this ‘grammar’ occur? A couple of recent studies have examined these claims about animal grammar with respect to communication in monkeys and birds. The interesting thing is that while the monkey researchers claim that their study animals cannot understand complex grammar, the bird researchers claim that their animals can. First, some grammatical background: the kind of structure we are talking about here is called recursive grammar. This is the ability to insert phrases or clauses within other clauses. For example, we humans can say, “The bird sang from his perch”, or we can go further and say, “The bird, who had just caught a worm, sang from his perch”. We can go further still: “The bird, who had just caught a worm that was wriggling in the dirt, sang from his perch”. It is theoretically possible to keep on adding to a sentence like this forever, and come up with something that is infinitely long (but technically understandable). In a recent paper in the journal Nature, researchers working with starlings claim to have demonstrated that, much like humans, birds can understand recursive grammar. Their methods involved creating a series of artificial songs following two different patterns: half of the songs had a novel element embedded into the middle of the song, while in the other half this element was added to the beginning or the end of the song. The results were that starlings could eventually learn to distinguish the two song-structure types. 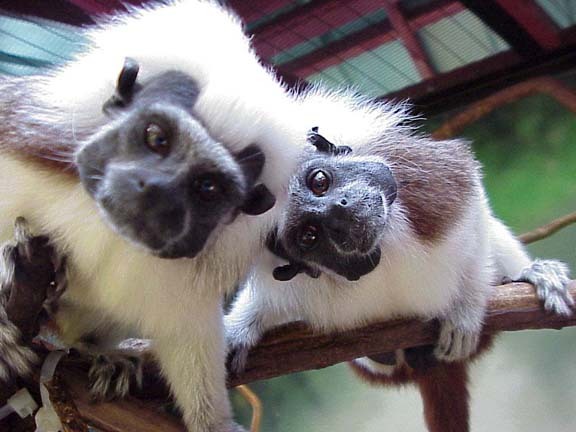 Interestingly, a similar study using cotton-top tamarins seems to demonstrate that recursive grammar is beyond the ability of these monkeys. This research involved teaching the monkeys an artificial grammar using recorded sounds, and testing whether or not certain deviations from the learned sound-order captured the monkeys’ attention. Apparently, the monkeys could recognize recordings that violated simple grammatical rules, but they did not respond to recordings that violated recursive grammar. The monkey study was published in the journal Science, and in the same issue the psychologist David Premack provides several reasons why he thinks animals have not evolved language in the human sense. Premack believes that besides the lack of complex grammar, the lack of teaching, imitation, and voluntary control of sensory-motor systems is what sets animal communication apart from human language. But I’m not so sure that animals like primates and birds lack imitation and teaching. In any case, it would be interesting to know more about the patterns and structures underlying the whole spectrum of animal communication. Here is a National Geographic article on the cotton-top tamarin study, and a Seed magazine article on starling grammar. Language Instincts: What’s in a name? The study of animal communication is the study of how – and why – information is transmitted between living organisms, whether of the same species or not. The bottlenose dolphin is one example of an animal studied for its chatty behaviour – it was recently shown that the signature whistles used by these social mammals may function like human names. The name of this blog, on the other hand, is based on Steven Pinker’s book “The Language Instinct”. Pinker argues that human language is an evolutionary adaptation “hard-wired” into the human brain; what I plan to do here is explore the evolutionary reasons for various communication systems in the animal world. My goal is to post weekly on a different avenue of research in this field. I have to admit that I’m no expert when it comes to the study of animal communication – the reason I chose to write about this topic is that it’s something that I’m interested in and would like to learn more about. Nevertheless, I hope this blog will be a good source of current findings to others who share my interest in biology and animal behaviour. As a side note, one type of communication that will not be covered here is that between animals and humans, since it isn’t a major part of the scientific study of animal communication (although apparently a career can be made of the talent to communicate with animals, even by telepathic means! ).